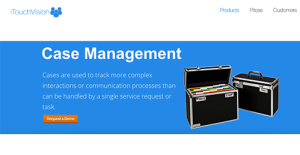 What is iTouchVision Case Management? iTouchVision Case Management is projected as the complete case management solution ever created. It has been the platform of choice for many users that require a completely functional and reliable case management system. Used by more than 250,000 users, iTouchVision Case Management System allows them to receive, prioritize, monitor, allocate, manage, and respond to their cases, which are organized in one comprehensive list. Compatible with Apple, Android, and Windows mobile devices, users can easily view and update their cases via smartphones and tablets and then allow admin teams to assess the information of cases in real-time. Immediate access and control over your cases via smartphones and tablets. Link cases together to get a 360-degree view of the issue and create solutions to address the problem. Easily assign multiple people to a case and determine their roles for better productivity. All information are stored on a centralized cloud database, including all relevant correspondence, emails, case notes, assessments and contacts can be linked to a case. Since each enterprise has specific business requirements, it is prudent for them to abstain from looking for a one-size-fits-all ideal software system. Needless to say, it would be useless to try to find such a system even among widely used software applications. The smart thing to do would be to jot down the various important elements that need consideration such as main features, budget, skill levels of employees, company size etc. Then, you should do your research thoroughly. Read some iTouchVision Case Management reviews and investigate each of the other apps in your shortlist in detail. Such comprehensive research can ensure you reject ill-fitting systems and zero in on the app that presents all the elements you need for business success. How Much Does iTouchVision Case Management Cost? A 3-month free trial period is also available. We realize that when you make a decision to buy Customer Support Software it’s important not only to see how experts evaluate it in their reviews, but also to find out if the real people and companies that buy it are actually satisfied with the product. That’s why we’ve created our behavior-based Customer Satisfaction Algorithm™ that gathers customer reviews, comments and iTouchVision Case Management reviews across a wide range of social media sites. The data is then presented in an easy to digest form showing how many people had positive and negative experience with iTouchVision Case Management. With that information at hand you should be equipped to make an informed buying decision that you won’t regret. What are iTouchVision Case Management pricing details? What integrations are available for iTouchVision Case Management? iTouchVision Case Management offers email integration as well as 3rd party integrations with systems that support diary and case management processes. If you need more information about iTouchVision Case Management or you simply have a question let us know what you need and we’ll forward your request directly to the vendor.